Content note: This will contain minor spoilers only. No guarantees about the comment section. Horizon: Zero Dawn is a 2017 video game that takes place in a post-apocalyptic world where robotic beasts roam the earth. The protagonist, Aloy, is an exile from the Nora, a tribe of hunter-gatherers. Aloy’s mission in life is to end her own exile, but as soon as she succeeds, she receives her call to adventure, and must venture out of Nora lands into Carja territory. HZD has some genuinely interesting things to say about race, far surpassing my expectations for a big-budget video game. Here I will discuss how the game hits the mark on several issues. Then I’ll discuss how the game has been criticized for cultural appropriation of Native Americans. Finally, I will discuss my own criticism: Where the main game succeeds, the DLC pack The Frozen Wilds falls flat on its face. Credit: AbyssOfUnknowing. 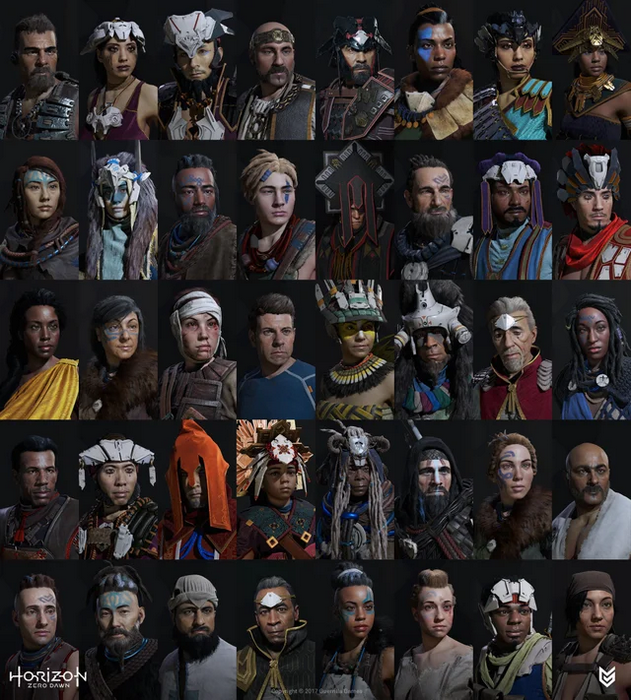 These are all minor characters, because the image was challenging people to name as many characters as they could remember. This is a repost of an article I wrote in 2013. I was reminded of this post because I recently wrote about a queer theory paper about video game economics. Wow, some of my references are quite dated! And this predates gamergate! Also, LOL at “I don’t intend to make a habit out of discussing economics”. Video game producers are most efficient when they make fewer, larger games, for many reasons. Developing a game is a one-time cost, while actually manufacturing the game is cheap. Selling more copies of a game is not a matter of paying for more manufacture, but paying for better advertisement and development so that more people want to play.1 Note that it’s much easier to advertise one big game than to advertise many little ones. The main reason to have more smaller games is to better cater to different tastes (e.g. see the indie game industry). There’s a board game slash art piece called Train, where players shuffle meeples around in a train, until they come to the realization that the game is about shipping Jews to concentration camps. At this point, the players stop, usually shocked and disgusted with their own complicity. But Train is a very unusual board game. Suppose we were playing another board game that involved putting brown disks, called “colonists”, onto plantations. Eventually, you put two and two together and realize that the “colonists” actually represent slaves, and you’ve been participating in trans-atlantic slave trade. Would you stop playing, feeling disgusted with your own complicity? Would you never play again? No, because you’re not playing an art piece, you’re playing Puerto Rico, one of the great classics of the Eurogame genre. So you just accept it as problematic, and play on. It isn’t just Puerto Rico. Many Eurogames feature themes of colonialism, erasing or sanitizing its most evil aspects, like slavery, subjugation, or genocide. Instead, these games focus exclusively on the interests and perspectives of competing colonizing powers. So, why do you think that is? Here I offer a bit of speculation. Last week, the white house held a meeting to talk about violence in video games, and their potential connection to gun violence. This has many gamers worried that the government will do something to censor video games, or pressure the games industry to self-regulate. My opinions on the matter: 1) this is an obvious ploy to “address” gun violence without addressing gun violence, 2) I defer to the research that says video games do not cause gun violence, and 3) the second amendment shouldn’t exist. If you disagree with any of these propositions, you are welcome to yell at me in the comments, as one does. But it also raises the interesting question, what do I want? Last year when I talked a bit about difficulty in video games, I mentioned the Dark Souls as an exemplar of difficult video game design. More recently, I had opportunity to play Dark Souls 3. I finished it too. So here are my thoughts. Like other adventure games, Dark Souls 3 is essentially a power fantasy. It gives the player a sense of increasing power over time. It begins by disempowering the player, beating them down over and over. But the player is empowered to eventually succeed. And what makes this experience so effective, is that the success depends almost entirely on the player’s skill and cleverness, instead of their character’s level. After completing the game for the first time, you can start over from the beginning and find it significantly easier. Something that this game makes me think about, what even is difficulty? Does it mean it’s mentally taxing? Does it mean it’s frustrating? Does it mean very few people can succeed? In the context of Dark Souls, people seem to think difficulty means “You die a lot,” but I’m not sure this is the right way to think about it. New players die a lot, but instead of thinking of it as failure, you could think of it as a necessary part of the learning process. One of the Dark Souls taglines is “Prepare to die”, which is literally telling players that dying is a necessary part of the game. Dying is even a essential component of the narrative–you’re a cursed undead who comes back to life each time you die. It’s not like other games where if you die, the universe rewinds and the game says “let’s pretend that never happened”. In other words, dying in Dark Souls is diagetic.